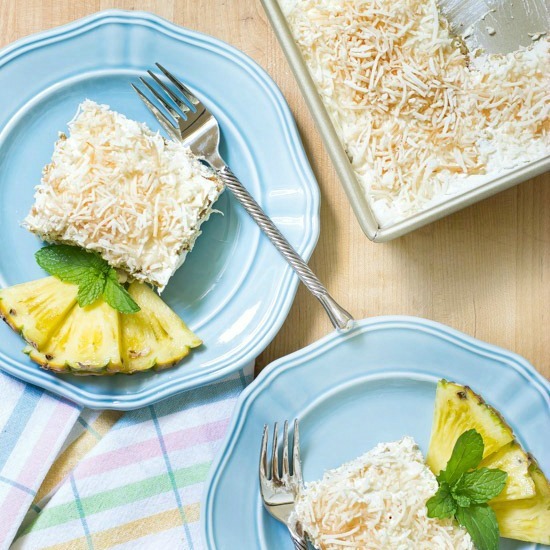 This Pineapple Fluff Icebox Cake with Toasted Coconut is the perfect summer dessert. It’s refreshing, light, and tropical! Not too long ago when I was hanging out with my dad, he mentioned a dessert my grandmother used to make called pineapple puff. I love trying to recreate old recipes but sometimes they take a little research. After a bit of looking, I finally found a recipe on the Kraft website and I’m pretty sure it’s the version my grandmother made. It calls for Stella D’oro Anginetti Cookies which (sadly) are no longer being made…so I decided to take the “puff” part of the recipe and spin it into an icebox cake. That icebox cake recipe is what I’m sharing today, along with a delicious collection of recipes made by a group of bloggers who love to spend time in their kitchens! We’re featuring easy and fresh recipes that are perfect for summer. More on that at the end of the post. The base for all my icebox cakes is graham crackers and Cool Whip. From there, it’s fun to experiment with different flavors, fruits, and toppings. When I think of pineapple, I think tropical. 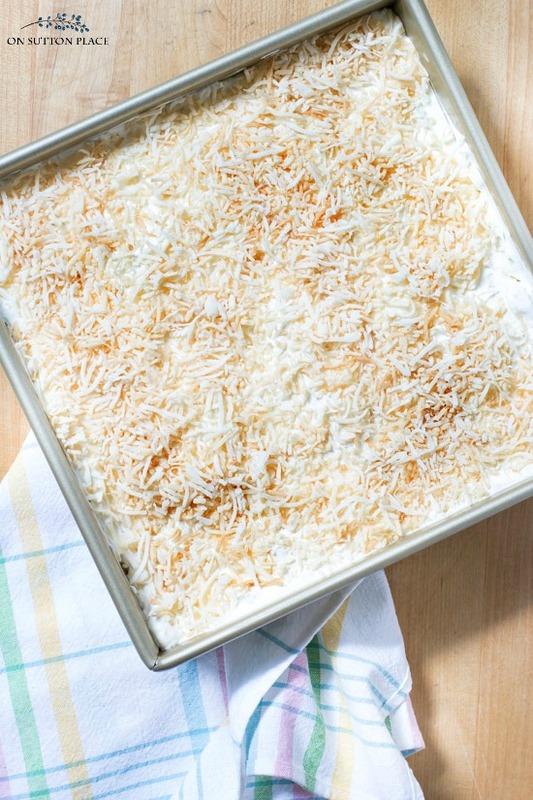 That’s why I topped this icebox cake with toasted coconut. 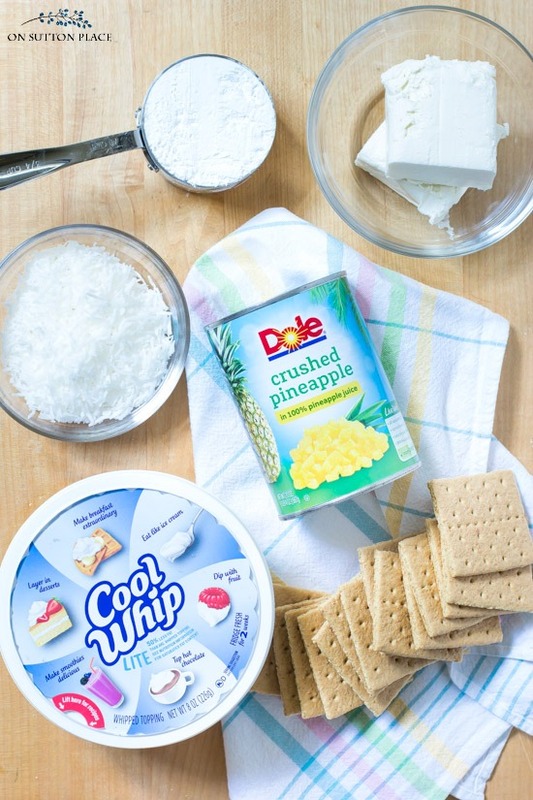 What could be more tropical than pineapple paired with toasted coconut? Of course, if you don’t like coconut, just skip that step! 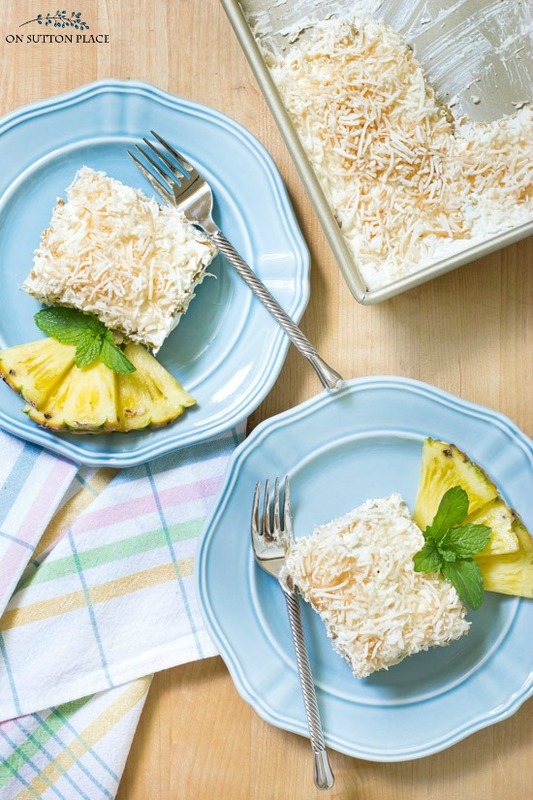 This Pineapple Fluff Icebox Cake with Toasted Coconut is the perfect summer dessert. It's refreshing, light, and tropical! Preheat oven to 325 degrees F. Spread coconut flakes on a cookie sheet. Bake for 8 to 10 minutes. Shake the pan halfway through baking. Flakes should be very light brown. Add the powdered sugar and beat until combined well. Add the Cool Whip and beat again until it's all mixed together. In a 9 x 9 inch pan, spread a thin layer of the cream cheese mixture. Continue with the cream cheese mixture and graham crackers until you have three layers, ending with the cream cheese mixture on top. 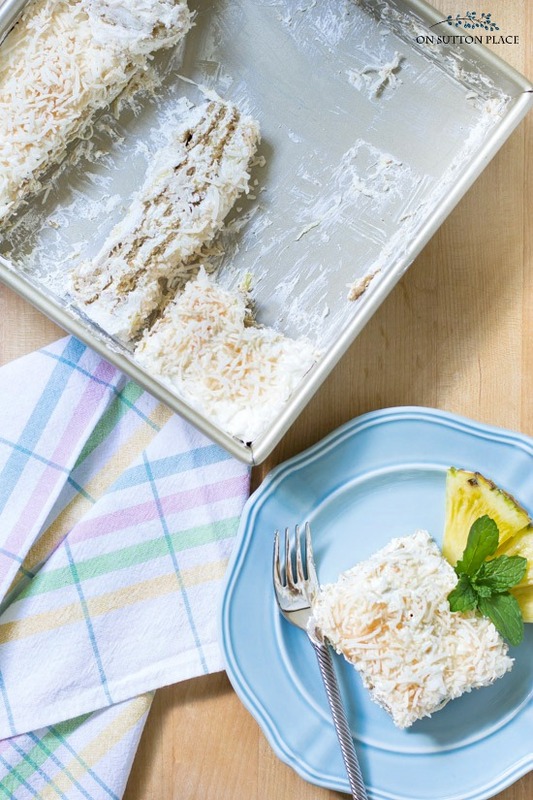 Sprinkle toasted coconut on top of cake. Cover and refrigerate at least 6 hours. More is better. Can be refrigerated overnight if you want to make it a day ahead. Like most icebox cakes, this version keeps in the refrigerator for up to 3 days. In fact, the longer it sits, the better it gets. It’s the perfect dessert to take to a summer potluck or picnic. It could easily be doubled and made in a 9 x 13 inch pan. I’m still really curious about the Stella D’Oro Anginetti cookies, so if you know anything about them, please leave a comment and give us all the scoop! Get my favorite 9 x 9 inch Goldtouch pan HERE. I’m so excited that the Seasonal Simplicity series is back again; and this time it’s to celebrate Summer! As promised, here is that talented group of bloggers sharing their summer recipe ideas. Lavender Blackberry Sparkling Lemonade at Satori Design for Living // Lemon Blueberry Cupcakes at Nina Hendrick Design Co.
My sister made the pineapple refrigerator cake for my visit recently, only she didn’t have the graham crackers. She made it with a graham cracker crust and it was delicious. So light and refreshing! Thank you. I had found this listing when I was writing the post…and it’s not active. It says “currently unavailable.” I really don’t think they are making this particular cookie anymore. Hopefully they will bring it back someday! Sorry! I should have clicked a little farther. 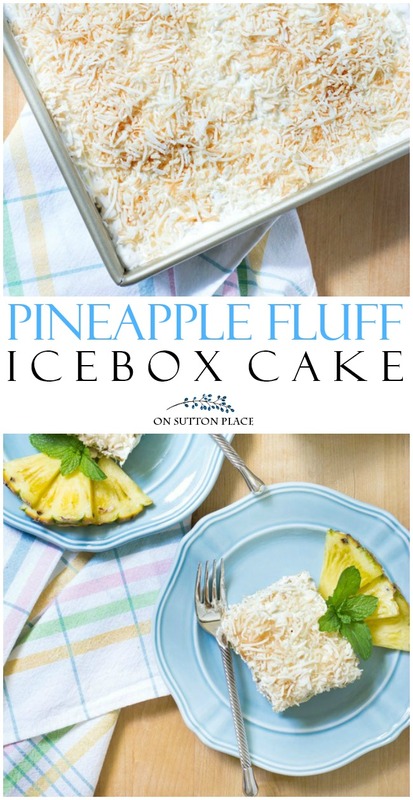 Anyway, I think your version as an icebox cake sounds delightful, and I will try it. I have tried all your previous recipes for icebox cake, loved every one, and they were all a hit when I shared them. Thanks for all you do. I so enjoy your blog. Ann, here is what I found regarding Stella D’Oro Angenetti cookies: http://slletsconnect.com/stella-doro/ . It appears there are many, many people who are interested in this particular cookie and want the company (or even another company) to bring it back. There appears to be at least one blog on Facebook regarding returning the cookie to grocers shelves. It is (was) my all-time favorite cookie! Hope this may help! This looks delicious and easy for summer. Thanks for sharing, Ann. Wishing you a lovely summer. The anginetti cookies are a lemon drop. There are recipes on line-Giada DeLaurentis has a true italian one. This looks super delicious, and I definitely think I could pull it off! Thanks for sharing! Pinned:) So glad you could join me on this hop, Ann! This looks so yummy for summer, enjoyable ! Ann, this cake brings back memories of one my Mom & Grandmother used to make.It did not us Stella D’oro cookies tho. If you’re interested I could post the recipe.